123,731 hardworking people on low incomes in Northern Ireland are set to benefit from a new Government savings account that offers a 50% bonus. The launch of the new account follows an eight-month trial, with over 45,000 customers who deposited over £3 million. 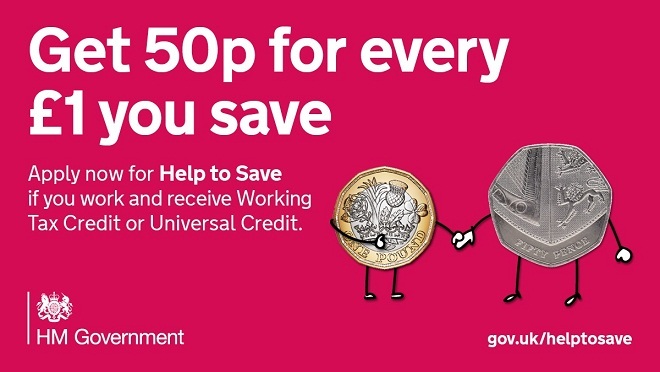 Help to Save is easy to use, flexible and secure, will help those on low incomes build up a ‘rainy day’ fund, and encourage savings behaviours and habits. John Glen, Economic Secretary to the Treasury said, “Savings shouldn’t be a luxury, they are an essential part of planning for the future. But for some, putting away even a tenner each month can be a tough habit to get into. After two years, savers get a 50% tax-free bonus on savings. If saving continues there is another 50% tax-free bonus after four years.